Talis Park is a work in progress. More accurately, it is already a work of art on its way to becoming a masterpiece of Southwest Florida elegance. The community features an architectural crafting that brings together neighborhoods in classic designs that range from Italian Renaissance to Spanish Eclectic and from Caribbean Colonial to Santa Barbara Style. Talis Park neighborhoods flow along the fairways of the championship golf course designed by Greg Norman and Pete Dye. 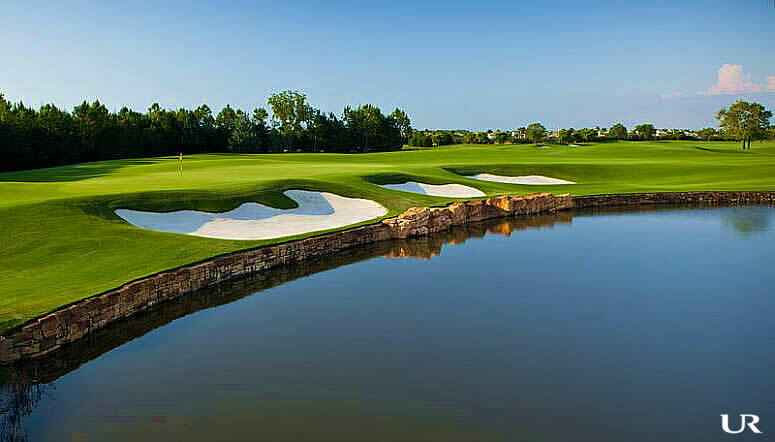 The course is regularly rated among the top twenty in Florida and is rated the Number Two course is the Naples area. Talis Park Homes For Sale - Updated Continuously! The Carrara neighborhood is comprised of penthouse-style homes in 15 four-story buildings, six homes per building, two homes per floor. These three-bedroom residences are 2,900+ square feet with a vestibule entry prior to the foyer and wraparound loggias. Corsica is a neighborhood of 64 luxury coach homes in 16 two-story buildings. First-floor residences are the Messina, a three-bedroom, three-and-a-half bathroom model with 2,532 square feet of living space. The Sienna model occupying the second floor offers 3,382 square foot, three/ three-and-a-half plan that includes a loft and a study. Il Corso is a waterfront neighborhood of 30 detach villas in one and two-story elevations with a Spanish Eclectic theme. These home is Il Corso range in size from 2,500 to 3,638 square feet. Firenza is exclusive even in Talis Park. It is a gated neighborhood within the gated community and, when built out, will be home to only 13 custom “grand estate” homes on lots that are more than an acre. The grand estate home options range in size from 8,000 to 12,000 square feet. Like Firenza, Prato Grand Estates in Talis Park are custom estate homes, but on half-acre lots. Homes range in size from 4,000 to 8,000 square feet under air. Except for the new Residences at Vyne House, the remaining neighborhoods in Talis Park are all comprised of custom single-family homes. Brightling at Talis Park features a blend of Caribbean Colonial and Spanish Eclectic, making for a uniquely beautiful scenario. Brightling homes feature three or four-bedroom layouts with total living space under air from 2,800 to 3,800 square feet. The homes in Fairgrove are slightly larger on average, with 3,400 to 4,000 square feet. Homes are available in with one or two-story floor plans with a blend of Italian Renaissance and Spanish Eclectic styles. Seneca is a neighborhood of 43 custom homes slightly large than those in Fairgrove. These three and four-bedroom homes range in size from 3,500 to 5,500 square feet. The piece de resistance of Talis Park will be the Residences at Vyne House. The 14 individually unique homes will be available with 2,563 to 5,648 square feet. They will be in a single, waterfront building where concierge and butler services will be available. The Bella Glos design includes a guest house with a separate private terrace. There is nothing else quite like Talis Park in all of Naples or Southwest Florida. Talis Park is setting a new standard for elegance, style, and luxury. Toscana is a condominium neighborhood of multi-story villas. These attached homes range in size from two to five bedrooms with 2,300 to 4,500 square feet of interior living space. Eighteen luxurious, Italian-style detached villas make up the Pistoia neighborhood. These villa homes feature large lawns fronting paver-stone streets. Residences are a spacious 3,400 to 4,000 square feet in size, with a classic Italian flavor, including barrel tile roofs.